You may or may not be familiar with my treacherously emotional ordeal concerning The Great Boot Hunt of 2009. 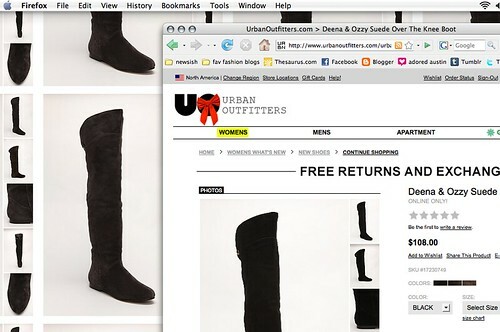 My readers here on Adored Austin are perhaps growing weary of hearing about my daily quest for the perfect, flat, grey, real suede, over the knee boot. Over 70 people have commented their condolences and/ or have taken the time to email me where they have spied this elusive Dream Boot of mine. Though sincerely appreciated from the bottom of my very picky heart, many of these so-called "sightings" were not actually my Dream Boot. Many were man-made suede, or not quite over the knee, or had a heel. Thus, I soldiered on. All of that changed last night. Hi. You don't know me, yet, but I love you. I have dreamed about you for most of this calendar year. My quest for you has sent me all over this great state of Texas, and it's killing me that I can't be with you right now. In my utter impatience for our inevitable meeting, I regrettably spent my boot money on a pair of Boot Disappointments last week, and woe is me. It turns out that they are non-refundable. I look at your picture and I am tempted to use the funds I've allotted for Christmas presents to secure your transport to me. I am faced with a great decision: gifts for loved ones -or- YOU for me. TRUST ME. It's a very hard and very difficult decision, but alas, I cannot bear for my presentless friends to look upon you with scorn. So, Dream Boots, I implore you: wait for me. Please wait for me until January, Dream Boots. I am coming for you. Do not give up! 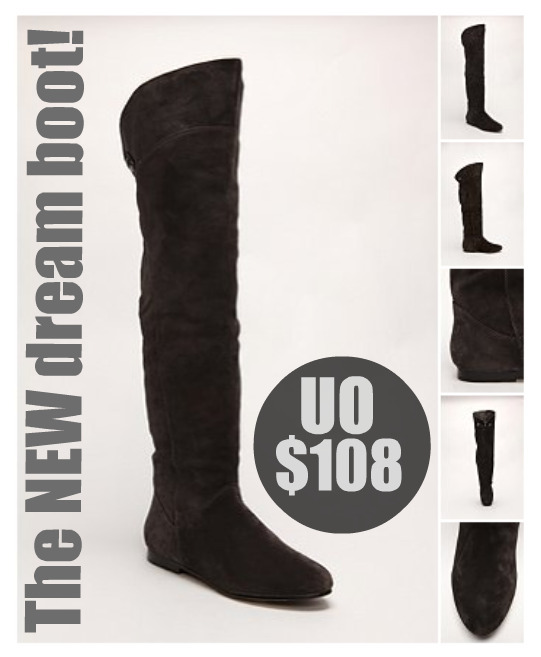 Update [midnight]: One girl's Boot Disappointment can now be another one's Dream Boot. Buy my Boot Disappointments on Craigslist and help me be with my one true destiny sooner rather than later. Better late than never, stud. This may be my new favorite outfit!